Arrestingly illustrated... Ellis, in her picture-book debut, draws with simplicity and precision, yet there are often so many fanciful details that second and third looks will come naturally. ... The whole effect makes the pictures seem like frameable art. It’s a work that confers classic gifts: time to look and time to wonder. [Ellis'] sly humor and irreverent spirit only endear her to kids and grown-ups alike. Ellis' compelling ink and gouache paintings, in a palette of blue-grays, sepia and brick red, depict scenes ranging from mythical, underwater Atlantis to a distant moonscape. ... Visually accomplished. A dreamy, painterly meditation on the diversity and range of dwellings around the world and across time and imagination. ... The text encourages the reader to participate (“But whose home is this? And what about this?”), and the cover illustration further extends the options of where we can live. All the choices are warmly inviting. A simple yet deep look at homes... This is a great vocabulary builder as you talk about all the homes — what makes them the same and what makes them different. Enchanting and accessible, "Home" is an instant classic for the K-3 set and a thoughtful Northwest-grown gift. 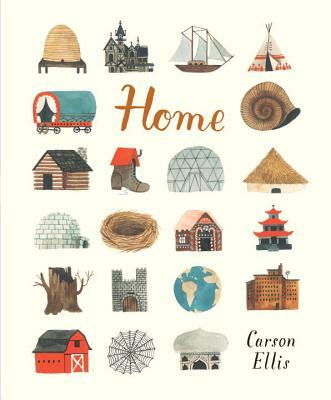 In her beautiful and inviting solo debut, Home, Carson Ellis (Wildwood series artist) illustrates the many different kinds of homes that humans and animals—past, present and even fictional—might inhabit. Skillfully rendered and artistically pleasing.